VW Beetle Volkswagen (VW) is a well-known German automobile manufacturer and Volkswagen means ‘people’s car’ in German. The Volkswagen Beetle (informally known as ‘Volkswagen Bug’) is an economy car manufactured by the company. With over 21 million cars manufactured in an air-cooled, rear-engine and rear-wheel drive design, the Beetle is the longest running and maximum number of cars manufactured on a single design anywhere in the world. The Volkswagen Beetle has outstanding features, sturdy body, amazing safety aspects and a host of other unique aspects. Although Volkswagen group has introduced an extensive range of superb models over the years, still the Beetle has many innovative features that many automobile enthusiasts look for in a car. Here are some of the advantages that people frequently refer to in support of buying a VW Beetle. One of the major advantages of owning VW beetle concerns its exceptional safety features Volkswagen regularly reviews all aspects of vehicles it manufactures and make improvements wherever necessary. Safety factor is one such area, which receives maximum attention from the company. The company makes appropriate changes in designs of their cars quite often with a view to enhance safety of the vehicles. Some of the features of the VW Beetle that makes the vehicle safer to drive include steel supports in the doors, running lights during the day and door reflectors. Another significant advantage in buying a VW Beetle is its affordable price. For a car with so many marvelous features, a price tag of $18,000 is undoubtedly very reasonable for an individual and makes VW Beetle an ideal option to own an incredible model, when compared with so many other makes and models. Depending on the type of vehicle financing arrangement obtained, monthly payments may work out to only a few hundred dollars, which is quite reasonable for a number of people VW Beetle has excellent gas-mileage. Fuel -efficiency of a vehicle is one of the major considerations these days as gasoline prices have been shooting up steadily over the years and there is no sign of relief from it so far. With 20 miles per gallon for city drive and 28 miles per gallon on the highways, the average annual fuel cost for an owner of VW Beetle would be around $1827, though this figure may go up a little with a recent hike in gasoline prices. 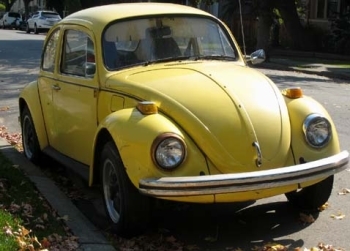 Nevertheless, when compared to other vehicles of the same size or even bigger vehicles such as SUVs, the gas mileage of VW Beetle is very reasonable. Another remarkable feature in VW Beetle, especially in summer months is provision of sunroof. While the automatic glass sunroof is a normal feature in the SE models, it is available as per preference in S models of Beetle. The glass sunroof is tinted so that it allows the sun only moderately for the comfort of the driver as well as the passengers of the car. The sunroof slides, tilts and is also equipped with ‘pinch protection’ as an added safety measure The Volkswagen name is greatly admired in the automobile circles. VW Beetle, with an innovative design and the body built to last longer, is a very safe car to drive. With outstanding gas mileage, affordable price range and cool sunroof, VW Beetle is, undoubtedly, among the most preferred cars by large number of people.